I use Fujifilm cameras, X-T1, X-PRO2 and X-E2. When I have gone thru the setup for the camera and flash it works just every third or fourth exposure in HSS. Everything is set right, as far as I know? Anyone who has any suggestion. It doesn´t matter what camera I use of they I´ve mentioned above. what firmware are you running on your xe2? if you can get HSS to work with it 1/3 of the time that is more than everyone else. i cannot get the V6ii to autodetect my xe2 with the latest fuji firmware (to my knowledge is what the xpro2 and xt2 are based on.) i haven't tried downgrading the xe2 since it is my main shooter and don't want to risk bricking it. But your X-T1 and X-Pro2 should work. Have you removed the hot shoe metal spring plate on your cameras? Did you turn on Forced HSS? Hope the above checklist helps. 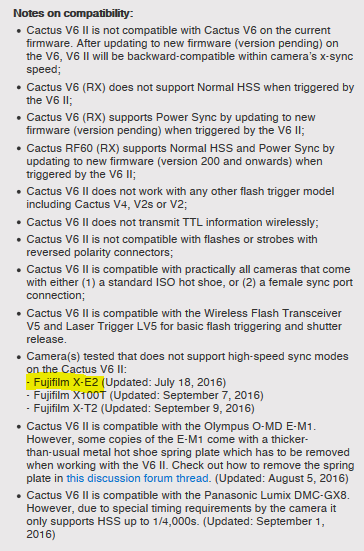 I haven't use the Cactus V6 ii at the x-e2 but at the x-t1 and x-pro2. I've done all the above, Antonio. I've got a beta firmware which I'll try. ... but at the x-t1 and x-pro2. I've done all the above, Antonio. I've got a beta firmware which I'll try. Hi there @petada, the beta firmware is made specifically for X-T2 users only. But it be great if you can also test if it also runs smooth on other Fuji cameras. Remember the key is to have a secure connection between the camera and the V6 II. And Auto-detect at device start up can help you make sure that it is.